After months of planning, Power Shift West 2011 is finally here! The event kicked off Friday afternoon with three keynote speakers who motivated the hundreds of students who traveled from Washington, Idaho, Montana, California and beyond to attend this grassroots environmental activism conference. CCN co-organizers Emma Newman and Lauren Ressler introduced the first two speakers, Dave Cobb of Move To Amend and Rob Dietz of Center for the Advancement of the Steady-State Economy, and also talked about the CCN and Sierra Student Coalition during breaks between the speakers. 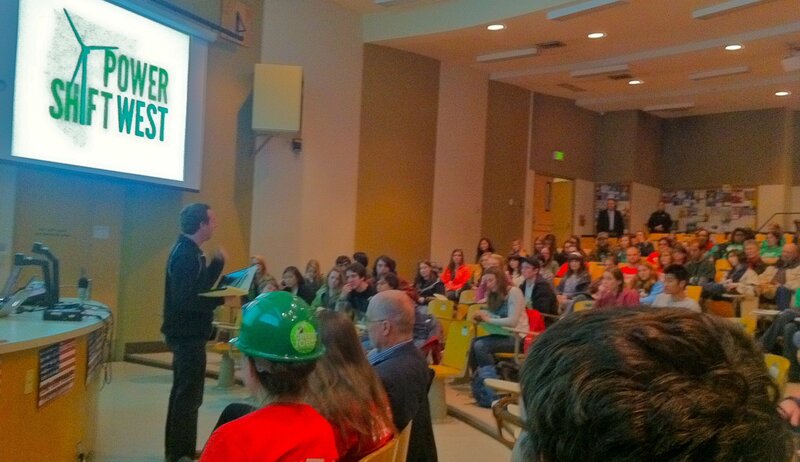 The last keynote speaker, Cylvia Hayes (first lady of Oregon with decades of sustainable energy experience), was introduced by ASUO president (and proud NW SPROG 2011 alum) Ben Eckstein. All three keynotes addressed the frustration caused by environmentally-degrading lifestyles and industries, as well as the opportunity – and the responsibility – to change them. If anything, Power Shift West will show our regional communities that we are ready and willing to accept that challenge. As Dave Cobb said, “what we know is the global climate crisis is the issue to solve,” and the systemic change we need is possible, but only if we work together to achieve it. So get your hard hats on, Power Shifters – it’s going to be a long, action-filled weekend! For all the latest updates, check out CCN’s Twitter account.